Yesomi Umolu at the Chicago Cultural Center. This past fall saw a plethora of programming on campus and in the city at large for the second-ever Chicago Architecture Biennial. As its third iteration approaches, the Chicago Architecture Biennial has named Yesomi Umolu to the prestigious position of artistic director. Umolu has been exhibitions curator at the Logan Center for the Arts and a lecturer in the Humanities Division and since 2015. The Maroon caught up with her over the phone as she begins to prepare for 2019’s Biennial. Chicago Maroon: What inspired you to take on the position of artistic director of the Chicago Architecture Biennial? 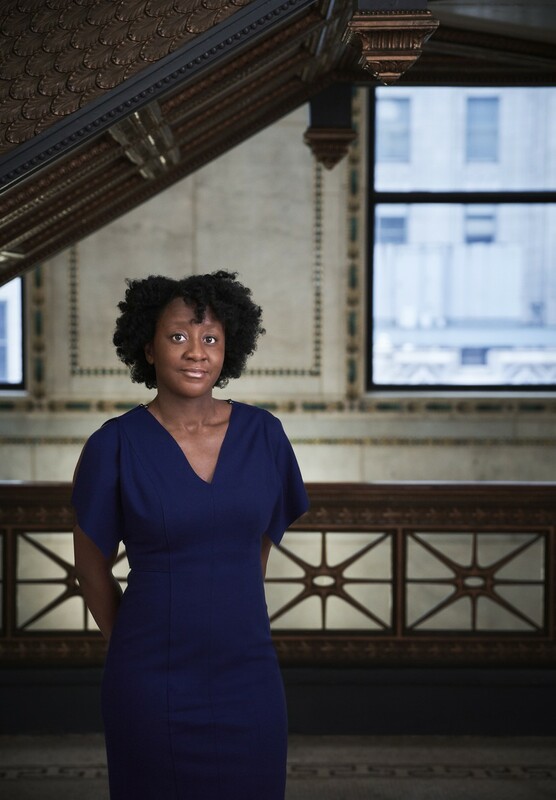 Yesomi Umolu: I’ve been in Chicago for the last three years or so, and I have been fortunate to witness the launch of the Biennial and the deep impact it has had on the city. Given my own background, which brings my training in architectural design together with curating contemporary art, I was very excited to take the helm of the 2019 edition of the Biennial. CM: What do you anticipate some of the biggest challenges to be? YU: The Chicago Architecture Biennial is a platform for the presentation of new ideas in the field of architecture. It garners a lot of attention from professional architects as well architectural enthusiasts. There is certainly a distinction between the needs of the profession and practicing architects, and the needs of the general public. It is challenging to figure out how we mediate between the different constituencies that the Biennial engages. But I also see this as an opportunity as very rarely does a curator get the opportunity to consider such a broad spectrum of publics. I am excited to work with my curatorial team to explore different ways of addressing these groups. CM: How do you see your curatorial practice at Logan relating to directing the Chicago Architecture Biennial, which is much broader in scale and in scope? YU: One of the great things about my position at the Logan Center is that I’ve been able to develop a program that caters specifically the Logan Center audience while connecting to national and international contemporary art dialogues. My position has also afforded me the opportunity to have broader conversations about the future of the arts, architecture, and urbanism on campus. I think the Biennial provides a perfect vehicle to coalesce some of the conversations we have been having on campus with a major international event in the city. CM: Is there any research that you have been doing in the last few years at the University of Chicago that you intend to incorporate into the Biennial in some capacity? YU: I don’t think there’s any specific research. I’ve been working with artists to produce new works that leverage the resources we have at the Logan Center as well as connect to our location on the South Side of Chicago and its the rich cultural histories. Our forthcoming exhibitions will continue this trend: we have exhibitions with Los Angeles–based artist Candice Lin, and a collaboration between artist Karthik Pandian and choreographer Andros Zins-Browne that will reflect on questions of intersectional identities, architecture and movement that are pertinent to our immediate surroundings as well as a global context. CM: Is there any particular direction from the previous two iterations of the Chicago Architecture Biennial that you want to continue, or any new direction that you want to take the Biennial that’s distinct from what we’ve seen in the last two? YU: I think that the artistic directors of the last two biennials have been really ambitious in the way they have engaged an international coterie of artists and architects in their curatorial project. I have been impressed by their imaginative use of the expansive spaces at the Chicago Cultural Center and various sites across the city. Our edition of the Biennial is certainly going to reflect my curatorial team’s position in the world and our thinking on current urgencies in the fields of architecture and urbanism. But we certainly aim to build on the good work that has been done with the past two editions. CM: The University had a lot of programming this fall as part of the Chicago Architecture Biennial. Can we expect to see the amount of programming increase even more in 2019? YU: The University has consistently created programs that align with the Chicago Architecture Biennial and that I am sure there will be a comparable set of activities in 2019. Over the last year a number of faculty colleagues—Bill Brown, Christine Mehring, Jessica Stockholder, Theaster Gates— have initiated the Sawyer Seminar on Urban Art and Urban Form. This series as well as others have raised the visibility of discourses on design, architecture and urbanism on campus. We very much have a critical mass around these fields and I believe that my involvement with the Biennial can amplify these conversations. CM: Are there any opportunities for students interested in the Chicago Architecture Biennial to get involved? YU: Of course! A biennial is very much like a roving caravan. It’s an institution that shifts and shapes with each edition. I think there will be ample opportunities for students to participate as interns or fellows, to assist with research, contribute to producing participant projects, or indeed facilitate our exchanges with the public once the Biennial is live. CM: Final question—favorite buildings on campus? YU: Too many! I live around the corner from the Robie House, so I have many occasions to appreciate this masterpiece. I really love working at the Logan Center because I think it’s a building that successfully brings different communities and activities together. I am very much looking forward to the new Rubenstein Forum building by Diller Scofidio + Renfro, whose work I have admired since my early years studying architecture. We have such an abundance of riches in terms of good architecture on campus that it is really quite hard to pick between them.